In an eagerly awaited boon for Melbourne theatregoers, Malthouse Theatre hosts Belvoir’s acclaimed 2014 staging of The Glass Menagerie. The meticulous production shows the riches to be uncovered in treating a classic play with both the reverence and fresh insight it deserves. 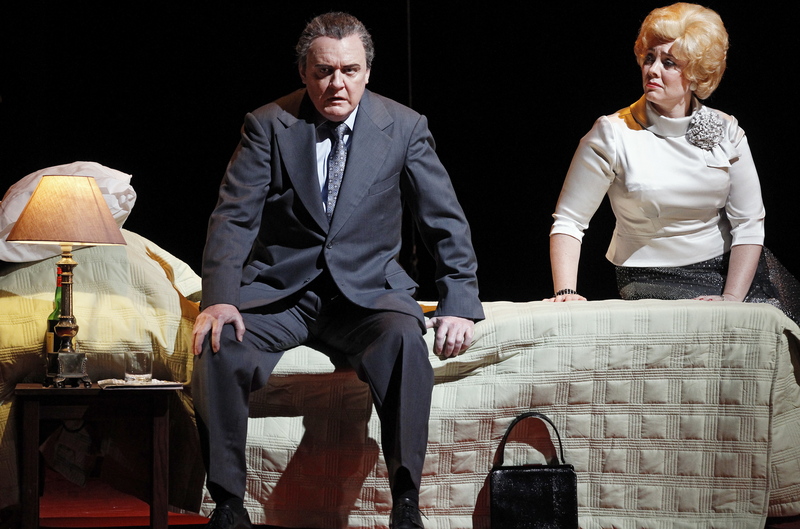 The use of live camera feeds was something of a trend in Sydney theatre around 2014. Given the perfect sight lines and relative intimacy of Merlyn Theatre auditorium, the video feed that is sporadically used throughout The Glass Menagerie warrants only a passing glance rather than offering detailed insight. Adding to the irrelevance is the disconcerting lack of synchronisation between voices and moving lips on the screens. It is at least a blessing that director Eamon Flack only uses the video screens as an addendum rather than as a replacement for great slabs of live action, as was the case in the recent ill-conceived STC production of Suddenly Last Summer. Arguably the most relevant contribution of the cameras and screens is their support of the play as “truth in the pleasant disguise of illusion,” as the character of Tom warns the audience in his early moments as narrator. Finishing his introduction, Tom changes costume from mature, worldly dress to simpler, boyish garb. Having costume changes in plain sight, along with scene changes carried out by the actors, also provides clear reminders that what we are watching is an illusion. Despite the capacious, proscenium arch-free playing space, Michael Hankin’s scenic design retains a claustrophobic atmosphere. 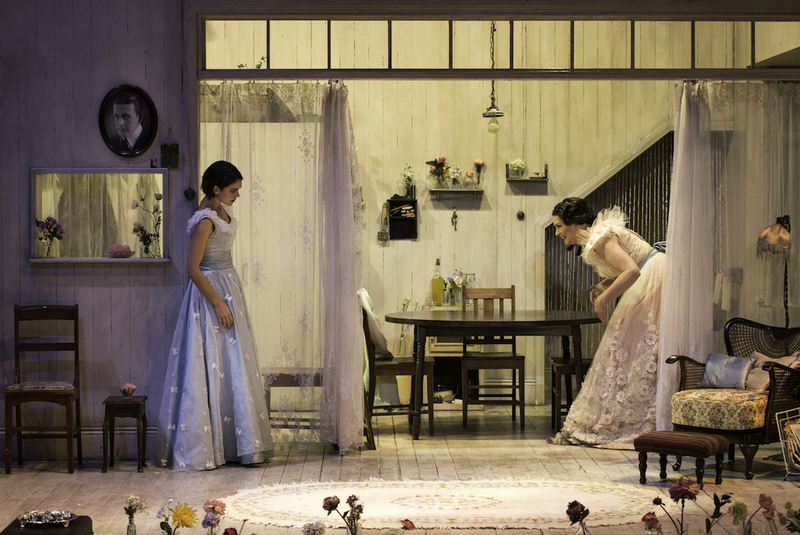 The whitewashed walls of the highly detailed set stand like a doll’s house amidst the modern technological trappings used to film, transmit and display selected moments of the action. 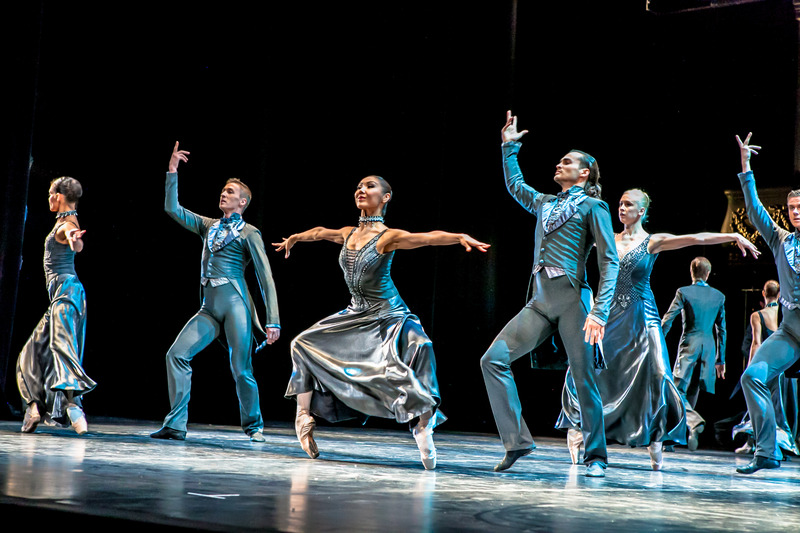 Mel Page’s costume design enhances the pale monochrome palette, just adding occasional splashes of colour for effect. Dressed to receive the gentleman caller, dear Laura is radiant in an ethereal pale green dress, and the momentary blossoming of her beauty is clear to see. Conveying matriarch Amanda’s detachment from reality, Page gives her fluffy pink layers of floral lace in a gown that, cruelly, no longer quite fits. Flack has combed Tennessee Williams’ text for nuances of meaning, providing an unflinchingly painful portrait of the choking oppression of unintentional familial cruelty. In this age of prolific social media connections, the concept of the desperate search to avoid loneliness is perhaps more relevant than ever. Watching friends’ adventures on Facebook from home is not too different to living next door to the music and coloured lights of a festive dance hall. 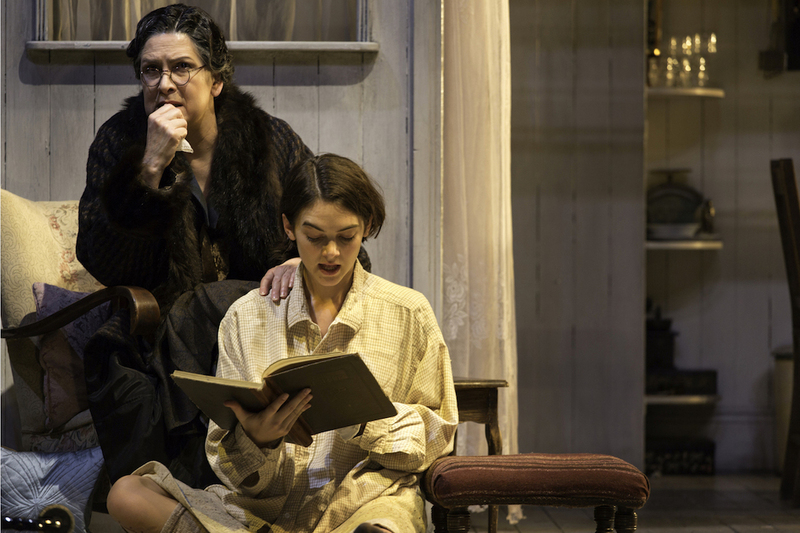 Playing one of the American theatre’s grandest and most grotesque creations, Pamela Rabe is nothing short of superb as faded rose Amanda Wingfield. Tall and imposing, Rabe’s Amanda dominates the cluttered apartment space yet carries a simmering fragility that adds to the play’s tension. Transported back to her youth, Amanda giggles and whoops with delight as she prepares to receive a gentleman caller, albeit one for her daughter. Rabe’s great achievement here is the utter lack of affectation or histrionics in this monstrous role that could dissolve into high camp in lesser hands. Flack’s interpretation of Tom is evidently in line with modern reading of the role as the embodiment of the closeted homosexual of the 1930s. Luke Mullins give Tom a polished, almost sibilant vocal tone, with just enough masculine edge for him to have survived working at the warehouse. In discussing possible gentleman callers for his sister, Tom is momentarily mortified when his mother asks whether there are nice young men at warehouse. 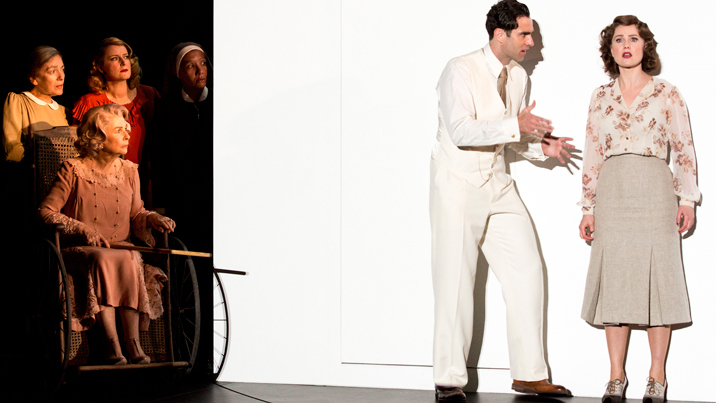 Mullins’ portrayal of Tom, and his delivery of the narrative elements, successfully takes the audience into his confidence and allows viewers to see the memory play through his eyes. In a neatly underplayed performance, Rose Riley conveys Laura’s inner turmoil with a minimum of external signs. Laura’s inferiority complex, which is more crippling than her damaged foot, is sympathetically conveyed. Dressed up for the gentleman caller, Laura finally has occasion to see herself as beautiful, providing a tender moment that Riley imbues with great dignity. As Jim O’Connor, the much-anticipated gentleman caller, Harry Greenwood delivers a cheery yet gently self-effacing energy in line with Tom’s description of the character as someone who is mildly successful yet has not achieved the potential shown in his youth. The extended candlelit scene in which Jim breaks down Laura’s defences only to shatter her fragile trust is expertly played by Greenwood and Riley. 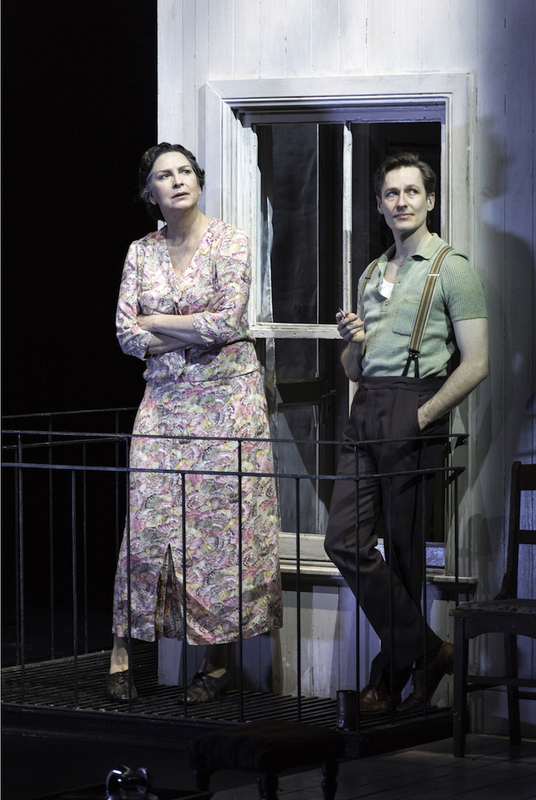 Lovers of great theatre should take advantage of the all too brief season of The Glass Menagerie. The Glass Menagerie was reviewed 1pm 21 May 2016 at Malthouse Theatre, Melbourne, where it plays until 5 June 2016. I am seeing TGM on Tuesday. Thanks Nick Hope you love as much as I did. Let me know! SIMON YOU DID IT AGAIN, GREAT REVIEW! What a moving production. I was a little bit nervous about the screen projections on either side of the stage, but they made perfect sense given what we are seeing is like a series of photographs coming to life through Tom’s memory. Pamela Rabe and Luke Mullins were brilliant, but the surprise standout for me was Rose Riley’s understated performance as Laura. She was simply heart-breaking.